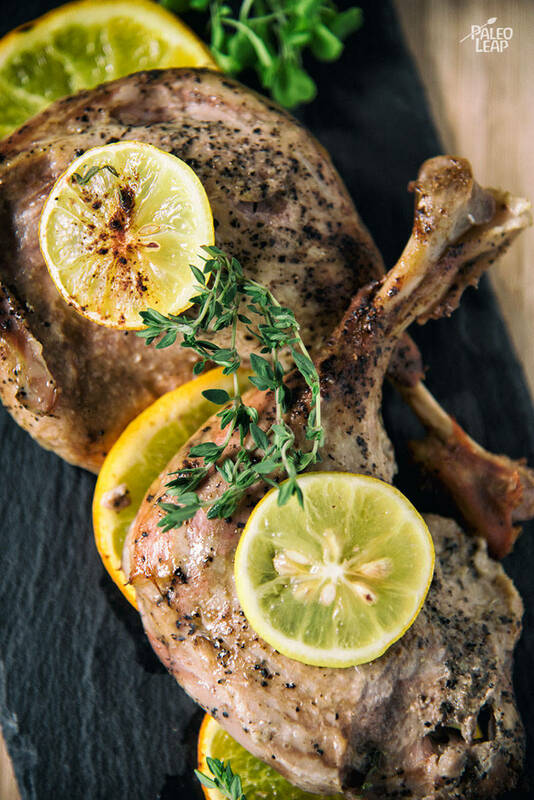 If you love a fattier piece of meat, duck legs are a tasty and tender protein to indulge in! In fact, duck is quite nutritious — it’s full of saturated and monounsaturated fat and lower in inflammatory polyunsaturated fats. Speaking of fat, duck fat can be saved, rendered and used for later. It will be solid at room temperature and have a creamy consistency, like butter! Have you heard of duck fat fries?! Now, that’s a treat! Where can you purchase duck? The first stop is a farmers market where you can find a farmer who sustainably raises ducks. While you’re at it, pick up a dozen of those huge, delicious duck eggs! Or, if you don’t have a local duck farmer nearby, check the freezer section of a grocery store or look for packaged duck legs in the refrigerator section. Serve these legs with roasted veggies like asparagus or delicata squash. Enjoy! Season the duck generously with sea salt, freshly ground black pepper and allspice. Brown the duck legs on a skillet over medium-high heat on both sides, 3 to 4 minutes. Place half of the lemon and orange slices on the bottom of a baking dish, then top with the duck legs. 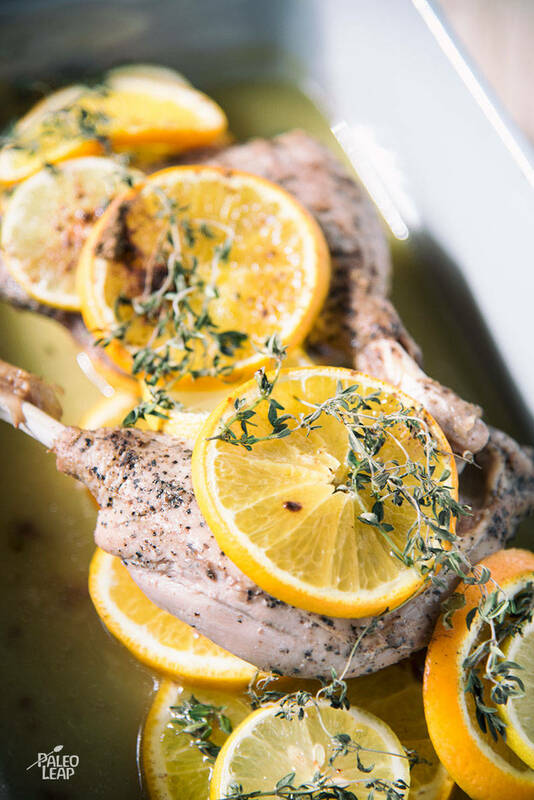 Place the remaining orange and lemon slices on top of the duck, then cover with fresh thyme. Pour the chicken stock and orange juice in the baking dish, then place in the oven. Bake 1-1/2 to 2 hours in the oven.